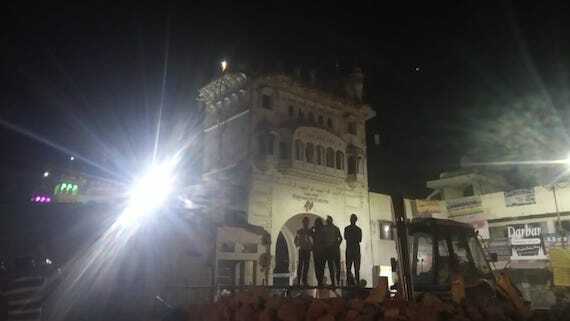 Local sources told the Sikh Siyasat News (SSN) that activists of Baba Jagtar Singh Karsewa started demolishing the Darshani Deori of Darbar Sahib, Tarn Taran Sahib tonight after around 9 pm on Saturday (March 30). As per information a number of people were gathered outside the Darshani Deroi and members of the Karsewa were demolishing the Darshani Deori with hammers. Some local Sikhs tried to stop the Karsewa activists and pleaded that the Darshani Deori was a historic building that was built during the “Khalsa Raj” in 19th Century and it should be preserved instead of being demolished but the Karsewa activists did not listen to them. “My younger brother talked to Karsewa men and urged them to not the demolish the Darshani Deori but they said that they were doing “Sewa”. When we told them that demolishing historic monuments was not ‘sewa’ they said that they would do whatever ‘Baba ji’ will order”, Harkirat Singh, a local Sikh, told Sikh Siyasat News (SSN) over phone. He said that when his brother insisted that the Darshani Deori should not be demolished the Karsewa activists attacked him. “Karsewa men attacked my brother and I somehow managed to save him from them”, he said. As per reports, the demolition work was underway at the publishing this news. It is notable that Baba Jagtar Singh led Kar Sewa had attempted to demolish this two centuries old Darshani Deori with the permissions of the Shiromani Gurdwara Prabhandak Committee (SGPC) in September last year. At that time they had tired to carry out the demolition during day time but the alertness of the local Sikh sangat had prevented them from doing so.